Not owing a car is a choice, and it isn’t a huge sacrifice as it sounds. Although, every time I speak about my conviction of staying carless, Mahrukh and Che avoid eye contact, and try hard to talk of something else. Then they walk away to the balcony of our apartment and gaze uneasily into the distant horizon, when I don’t stop hectoring. A lot of people think I’m not quite all there when I tell them that not only do I not have a car, I don’t even have a cellphone. They emit a short nervous laugh and slowly edge away from me. Living in Toronto without a car has been easy. The transit is great, especially when one compares it to Mumbai. There is a bit of a problem in getting outside of Toronto to suburbs such as Mississauga, Brampton, Markham, and Oakville. A trip to one of these places turns into an expedition. Again, it’s not so much connectivity but time that is an issue. I do get around, especially to Mississauga because of some truly great events organized by the South Asian community there. Tuesday, braving the gloomy weather, and a complete absence of transit connectivity, I reached Flato Markham Theatre just in time for the readings to commence at the International Festival of Authors (IFOA) Markham. Throughout an unending and circuitous journey, thanks to misreading Google Maps, I was circumspect whether my herculean effort would be worthwhile. IFOA-Markham was an exquisite mix of different cultures, different genres and altogether riveting readings from writers who were obviously creative, and surprisingly confident. Marjorie Celona, Ayesha Chatterjee, Chan Koonchung and Vincent Lam made the evening memorable. Celona read a passage from her debut novel about Shannon who is abandoned outside the YMCA as an infant. There is an obviously raw and an edgy quality to her novel, and Celona’s evocative reading brought alive the unpleasantness her protagonist’s life. Ayesha Chatterjee made me feel at home in a place I had never been to before when she greeted Subho Nabami to everyone in the auditorium. Ayesha read from her collection The Clarity of Distance – poems she wrote when she moved from Germany to Toronto, and a few of them from and about Calcutta. Her poetry is steeped in Indian traditions, and she narrated the story from the Shiva Purana of the Hindu trinity and the Ketaki flower. Once Shiva had to intervene in a quarrel between Brahma and Vishnu. Vishnu that whoever found the end or the beginning of the pillar would be declared superior. Vishnu took the form of a boar and burrowed to seek the end of the pillar, and Brahma took the form of a swan and soared up to seek the pillar’s beginning. Vishnu returned after a while, admitting defeat. Brahma couldn’t find the beginning, but took the help of the ketaki flower (which Shiva used to put into his hair) and lied that he had reached the top of the pillar. Ketaki corroborated the lie. An infuriated Shiva cursed Brahma that he wouldn’t ever be worshiped in physical form like other gods in the Hindu pantheon, and he banished ketaki flower, which is not used in Shiva’s worship. Chan Koonchung’s The Fat Years is story of a missing month, and a bunch of kids who kidnap an official to confess the truth. Chan’s reading was peppered with commentary that brought the novel alive and gave it immediacy and a meaning. 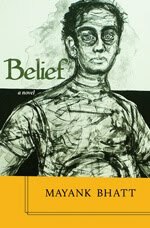 In his novel, Chan said, he had forced a bureaucrat to confess to the truth. Such a thing can only happen in a novel; in real life the bureaucrat would take the secret to his grave. Finally, it was Vincent Lam’s turn, and he read Percival Chen’s story. Lam gave a brief glimpse of why The Headmaster’s Wager has received glorious reviews everywhere. As the evening moved on to the Q&A session, I left because I’d have to take a cab to the nearest subway station. That’s a bit of a problem because I don’t have a cellphone, but an obliging volunteer used his cellphone and Ahmed Taha from Jordon of Rush taxi took me from Markham to Don Mills subway station. It was late and raining and I was tired and drenched by the time I reached home. Tired but happy. Thank you Sheniz Janmohamed for a great evening and for thinking of involving Generally About Books as community partner of the event.